This summer as with seemingly every summer English Premier League sides seem on a mission to outspend one another in the transfer market, spending in the 2017 summer transfer market is forecasted to break records as clubs engage one another in the ever spiraling arms race. Clubs that is, with the exception of Tottenham Hotspur. So far this window Spurs have not signed a single new player, reasons for this vary from the cost of building their new stadium to the notoriously frugal chairmanship of Daniel Levy but so far coach, Mauricio Pochettino, has followed the company line and insisted that he is in no hurry to strengthen the squad. The week before this fixture however injured left back Danny Rose made some incendiary comments in a newspaper interview insisting that the club needed to spend and take in top class players to bolster their title chances. The opening match of the Premier League away to newly promoted Newcastle United therefore came at a time when questions about the harmony of the squad were circulating. Already without the likes of Danny Rose and Kieran Trippier and with England international right back Kyle Walker sold to Manchester City for a large fee it remained to be seen whether Pochettino’s side could continue last seasons excellent form in to this campaign. As it turned out Spurs fans had no reason to be concerned. Newcastle United were the dominant side in the Championship last season and they come in to this campaign under the excellent Rafa Benitez with the hope of making a significant impact on the competition. Although there are questions surrounding the perceived lack of investment in the first team squad we still saw three players make their competitive debut. Right back Javier Manquillo, central defender Florian Lejeune and left sided attacking winger Christian Atsu who has spent last season on loan at the club. They lined up in a relatively rigid 4-2-3-1 system with Atsu and Matt Ritchie expected to provide the width to the attack. The Spurs line up was slightly harder to predict. With Kyle Walker gone and Kieran Trippier injured we saw youngster Kyle Walker-Peters slot seamlessly in to the team. In midfield the attacking triumvirate of Christian Eriksen, Dele Alli and Mousa Sissoko appeared almost positionless as they interchanged in the final third, creating and exploiting space. Although the system on paper appeared to match the 4-2-3-1 of Newcastle, with narrow attacking midfielders it was noticeably more nuanced. One of the central themes of Spurs’ successful season last term was their ability to manipulate and exploit space, especially in the final third of the pitch. On the evidence of this match we are likely to see this continue in to the new season. The aforementioned Eriksen, Alli and Sissoko were a constant menace for Newcastle and when in the second half Song Heung-Min came on, the Newcastle defensive structure was stretched to near breaking point again and again. It was not only the attacking players that were instrumental in this, however, with both fullbacks, Kyle Walker-Peters and Ben Davies showed again and again that Spurs will be a force this season. Here the key comes from the run of left back Ben Davies, with Moussa Sissoko taking up a position hard against the touchline on the left hand side and Dele Alli occupying the half space on that side in an advanced position Spurs were already in a structurally strong position. The key however, comes when Davies makes a run towards the central position from his left back slot. The notion of inverted fullbacks was much publicised last season with the arrival to English football of Pep Guardiola, in truth however, this is an attacking concept that has been around for some time, Guardiola was simply the first coach to utilise it on any regular basis. Here, as Davies bursts forwards he drags defensive players with him and creates an opportunity for Sissoko and Alli to link with one another and build an advanced platform from which Spurs can attack. In the second half of the match Newcastle had England international midfielder Jonjo Shelvey was sent off for a deliberate stamp on the ankle of Dele Alli. From that moment on the match was effectively lost for Newcastle as Spurs were left with even more space to exploit in the final third. Here you can see the moment that led to the opening goal of the game for Dele Alli. Note the width on either side of the attacking structure that is offered by Davies on the left and Walker-Peters on the right. Down to ten men, the Newcastle defensive structure has been forced narrow and with this image captured after a sustained period of Spurs pressure you can clearly see that the structure from Newcastle is disorganised. Appreciation of space is key to the goal, first of all Alli has to see the space to attack in the penalty area and time his run to stay onside, secondly Eriksen has to also see the space and anticipate the movement from Alli in order to play the ball into the correct zone. A relatively simple looking goal was actually more nuanced that it seemed. Another hallmark of Spurs play last season under Pochettino was the intelligent way in which they progressed the ball through the thirds of the field, they always seemed to move the ball intelligently. This match was no exception as they displayed excellent patience before making the breakthrough in the second half of the match. This passing network courtesy of the excellent @11tegen11 using opta data shows the central focus to the Spurs attacking phase. They combined extremely well in central areas before moving the ball out to the fullbacks in the final third in order to manipulate the defensive block before switching back inside again. Note as well the advanced position of Dele Alli on the network as he joined Harry Kane on the last line again and again. Here we see an intelligent piece of movement from Danish international Christian Eriksen which created space for Spurs to play through. With Toby Alderweireld in possession Spurs tend to look to break the initial line of opposition pressure in order to allow the forward players to play from an advanced platform. Here we see Dier moving from a central area out in to the left half space and dragging his marker Shelvey with him. This small piece of movement creates the passing lane from Alderweireld to Sissoko and straight away Spurs are attacking from a strong position. On this occasion we do see Spurs access the space in the wide areas as Walker-Peters is completely unmarked out on the right hand side of the pitch. The key is in how the ball is played out to the right back, a simple direct ball is risky from this angle as the opposition could either move to intercept or shuffle across and close the space quickly, at the same time a pass to Dier who is supporting Dembele centrally is also less than optimal as it will encourage Newcastle to move out and close down the man in possession of the ball. Instead the ball is first played in to Dele Alli, this pass pins the defensive block where it is and then the ball is set back for Dier before being played out to Walker-Peters. Sometimes in football it is the small details like this that make the difference. As mentioned previously, the positioning of the Spurs side in possession was rarely fixed and instead players were fluid in moving in and out of different zones in possession of the ball. 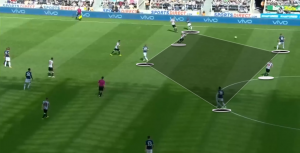 This fluidity made it very difficult for the Newcastle defensive unit to make an impact on the game and allowed Spurs to enjoy long periods of sustained pressure on the opposition goal. Here we see Spurs in possession of the ball out on the right hand side of the pitch with Walker-Peters. With Dier inside, Kane ahead and Dembele behind the Spurs structure of support creates a 4v3 against the Newcastle defensive players. This positioning from Dembele was a constant for Spurs until the sending off in the second half with either Dembele or Dier supporting behind Walker-Peters to make sure that the youngster always had an option if he got in to trouble. With this structure Newcastle found it very hard to apply any significant pressure to Spurs. Here you can see Spurs creating another passing network in possession with a 4v2 against the immediate Newcastle pressure. These passing triangles that are created all over the field as Spurs move the ball forward ensure that the player in possession of the ball always has more than one passing option should they find themselves under pressure from the opposition. The sending off perhaps puts a slightly different reflection on the match but in truth Spurs were never troubled by this Newcastle side, as the expected goals from the match show. Once more this data was provided by @11tegen11 using opta data. An XG for Spurs of 2.29 for Spurs as opposed to 0.41 for Newcastle shows that the right team won the game. Spurs still appeared slightly rusty as can be expected from the opening weeks of the season and Harry Kane on another day may well have scored a hat trick. One thing is for sure, however the rest of the transfer market goes for Spurs they are going to be one of the teams to watch this coming season.